Rebels wing Cooper Vuna has been banned from using social media outlets like Twitter and Facebook and banned for one match following his altercation with Kurtley Beale on the team bus last Saturday. An investigation by the Rebels into the incident was completed on Wednesday. Vuna was in hot water as at the time he tweeted: "I need to leave right now, this ain't for me! I tried to help someone but got punched so instead of putting him in hospital il leave!" When he was asked who he was referring to, he replied: "Hmmmmm his name is kurtley_beale bloody grub!" "The franchise endorsed the immediate sanction of standing Vuna down for this week's match against the Cheetahs in Bloemfontein," a spokesman said, adding the player had given "private undertakings not to take part in any social media activity". "I am deeply sorry for the embarrassment this event has caused to the franchise and the people I love," Vuna said. 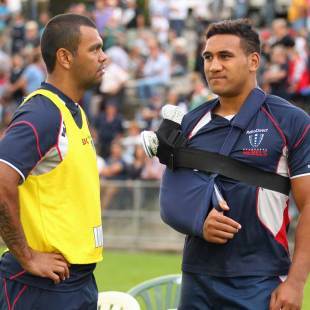 "During my time with the Melbourne Rebels I have turned my life around. "The outcome of this incident in Durban is not consistent with the values of my family, my church and my football franchise. I apologise to the many loyal Rebel fans who have been an inspiration to me."